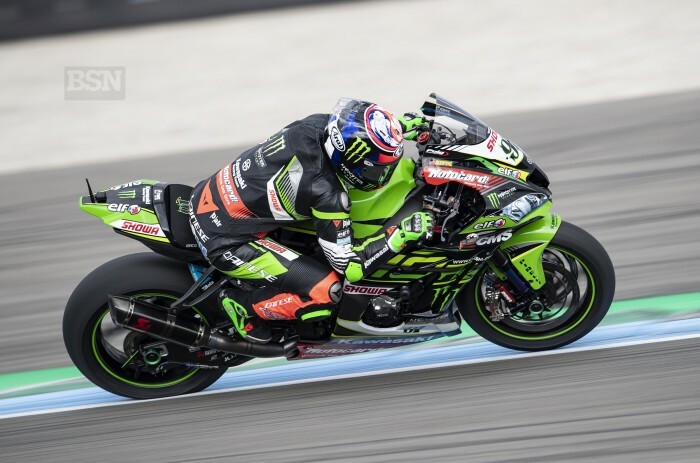 For Leon Haslam a return to WorldSBK duties, in the works Kawasaki squad no less, has been both up and down in many regards. Up for him is how quickly he found real pace in the class, after several seasons in BSB and only a smattering wildcard rides. “For me, obviously, Australia was a lot closer than I expected,” said Haslam on he eve of the Assen racedays. “To have three years out of this championship and to battle with a four-times world champion - that has absolutely smashed everybody for the last four years - that was much more than I expected in the very first race. In Thailand I expected podiums but injury was the biggest factor, not the bike. “In Aragon we had a disastrous Friday and Saturday, with the settings, but we made such a big step on Sunday again we battled with Jonathan until the very last lap. Haslam said that Sunday in Aragon saw a real improvement in his bike and rider relationship, via the onboard fireworks package. “It is an electronics thing that we found and at each track it varies but our base set-up of the chassis has been the same setup at every race. All the time he has been riding Haslam has carried a pre-existing medial issue with him in 2019. “My ankle has a nice little hole in it right now, and I can see it is leaking… I will show you, you will like it!” said Haslam, taking great delight in showing off his injured ankle to the media. ““It is kind of healed from the inside. I am on a course of antibiotics just to try and not get any infection. After this we have three weeks before the next race. I had an operation before Aragon and that split open during race one there. It has been interfering with my training. I cannot run, and this winter we have done a lot of Supermoto and I have really struggled to wear the boot. “My dad modified my boot for the Sunday in Aragon and – although I did not think it was affecting me – now I have a modified boot and it does not hurt, it feels so much nicer. Haslam’s cist on his left angle bone is a throwback to his dramatic crash at Brands Hatch in the final weekend of the 2017 season, when his brakes failed and he had to jump off the side a high speed, impacting the trackside barriers hard. The cist that formed in the winter burst during race weekend in Thailand, and hence he had an operation before Aragon, but the stitches burst open during the race in Aragon. “Something very stupid has lasted forever for me,” laughed Haslam at his own misfortune.